MSV has some bombs with big stories coming. First, MSV officially announces its new RaviLeaks program. Currently, the public has not a clue how many deals Mayor Ravi Bhalla has cooked up with his second "no show" job with a NJ politically connected Republican law firm. While the public has heard it's an annual $60,000 salary plus uncapped commissions for delivering new re: government-related business, no one knows how much loot Ravi has cashed to date. Ka-Ching! So in the spirit of transparency dreadfully needed, MSV invites all those with information on that suspect Ravi Bhalla employment contract and any other items of public concern to send it over for the scrutiny of Mile Square residents. Submit the truth; all documents, checks and video of cash transactions welcome. Show me the money! Who in Hoboken has that sinister but familiar ring? Hi Ravi, how ya doin? Submit any and all relevant items you deem important to the RaviLeaks hotline at smartyjones@me.com. All information will be kept in strict confidence and is covered under the umbrella of MSV's proven NJ Shield Law protections for journalists. 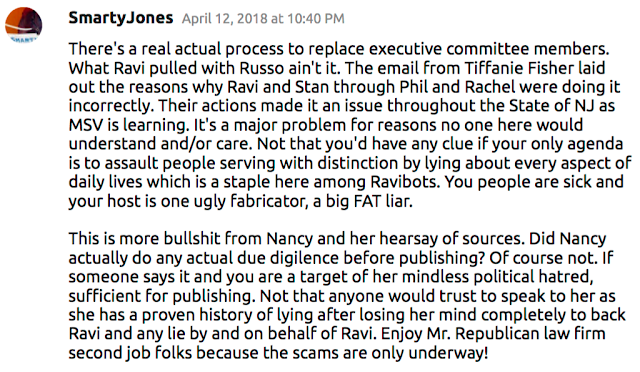 There's more on Sybil coming undone and the Ravi-Russo-Cammarano connection. doing the dirtiest against everyone and anyone who doesn't kneel to Ravi. The filth gets worse and worse but the lying, endless. So Sybil's Cave, the rank defiler of truth and provider of all misinformation to aid and abet Ravi Bhalla, published accusations Councilwoman Jen Giattino muttered the "f" word during the last Democratic Committee Meeting. The Hoboken Democratic Committeee meeting also known as the latest episode of a Stalinist show trial to dethrone its Chair Tiffanie Fisher. She's guilty for the Ravibot crime of backing the best candidate for mayor in Giattino last year. There's much pretense the committee isn't committed to Hoboken municipal non-partisan elections in the Mile Square City. It says they are in their own bylaws. You can expect that to change with the coup to serve Ravi Bhalla's appeal to hyperpartisanship serving, wait for it.... Ravi Bhalla. What is it with these "Democrats" and their love of coups and overthrowing elections and the Bill of Rights? So Hoboken council members who are registered Democrats may attend committee meetings and the musty hostess of the Cave decided that making an allegation was fit to print but an accuser should be protected from being held publicly accountable. She refers to the accuser as "redacted." She plays this Hoboken411 gutter game frequently and if it's to dismember good governance members of the council with SUPERB RECORDS of service on AND off the council, Syb's all in. It wasn't long ago when ye ole crusty Sybil not only didn't make lying for a cult of personality a daily staple but praised the work in the trenches in Hoboken's bad old council days of Jen Giattino, Peter Cunningham and more recently Tiffanie Fisher. While all three are committed to doing the best they can for Hoboken, none of the three will pledge a blind oath of fealty to promise-breaking, dual job Republican money loving Ravi Bhalla. Hoboken's new mayor in addition to showing a penchant for being truth-challenged like his paid political operative has notably announced war against those who failed to do so and refuses to speak or respond to legitimate government inquiries from its elected representatives on the City Council. Who beyond Ravi Bhalla has the problem? Well, it's the chronic pathological liar who serves as a demented cult leader of Ravibots. Having looked into this filth typically avoided, (it's far worse than Hoboken411 was in its heyday on behalf of Beth Mason); it seemed a good time to make a stampede among the cave-dwellers. Admittedly, it's fun to hit the place with a stampede of truth. Like spraying Raid on a roach motel, it causes quite the commotion. From investigating the sham HDC meeting Monday, (there's loads of legal problems how this administrative action creates similar for committees Statewide) the alleged f word was not mumbled. Sybil launched into her typical ones when censorship at the Cave was challenged as seen here below. A loud decrying of the Stalinist show trial during a screed of slander by one Nora DeBenedict-Arnold would have been in order. Of course not all are accountable for such bad behavior such as good governance executive committeeman and my friend, Das Giant, Kurt, but there never was any "f" word splayed against everyone. Of course, this was met with the typical censorship the Cave is known for - over years! Disagreeing with the site owner is akin to crapping in her living room. (That's her defense of censorship there for many a year.) The response for daring to illuminate truth led to this typical anticipated reaction. And the stupidity went on and on from the f-bomb wielding, lying is my Constitutional right and so is dirtying up anyone who dares to not bow and worship Ravi Bhalla, yada yada. Now if hearsay with unnamed sources is the standard of fairness and publishing, what do you think MSV's new RaviLeaks investigation will uncover? 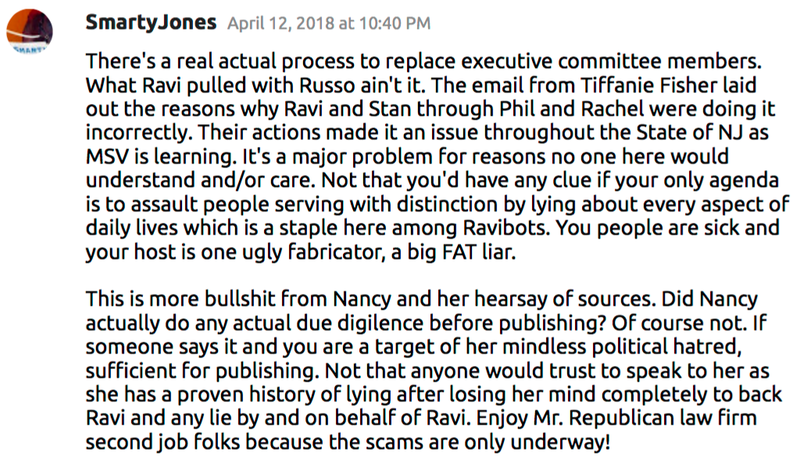 Perhaps we'll learn more about the behind closed doors Ravi-Russo Team deals and some choice f-bombs by him? Or perhaps Hoboken will learn how much of that NJ Republican law firm loot is being cashed and what government contracts near and far are being traded on under the color of criminal "right?" Hoboken, don't let a Horse down. The Hoboken people want and demand to know every unethical, dirty dollar being hoovered up in Hoboken City Hall on the second floor! Talking Ed Note: Of course Sybil can photoshop pictures of a Horse again, add 20 to 30 pounds and publish lies like she did on Election Day that there was illegal activity in a polling station by this election day challenger. Of course other victims will see their names published and be similarly victimized and ambushed with these type of lies in the future. That's her service to Ravi against good government council members as the de facto head Ravibot. NJ paid political operatives, they're so lame. Sad! There's more to come with an exclusive on the Ravi-Russo-Cammarano connection. Update: Lots of crying for self-inflicted bad behavior over at Sybil's Cave today. Were any of the victims of the purported allegations contacted? Why are victims trashed with publication and any name of the person making the accusation protected? That's not even low brow "he said, she said" nonsense. That's part of the methodology of Hoboken411 back in the day and it's appalling. Now, if that's the dirty game you want to play serving Ravi Bhalla going into the gutter repeatedly swimming in sewerage since last year, then own it. Same BS game done on Election Day. This editor served spending over 14 hours in polling stations to ensure voter integrity as a challenger for the Giattino campaign. Retained the badge and proud of the work uncovering an actual bonafide major election violation at the polls during the election. 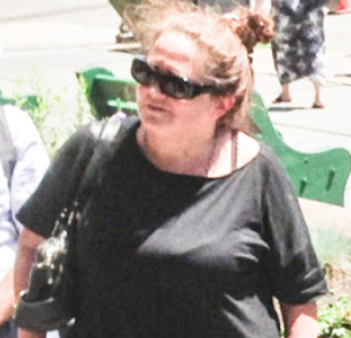 An attack using a Russo Clan submitted photo in retaliation for the above-linked story later photoshopped at the Cave made false accusations of "loitering" in the polling station and "electioneering" for the Jen Giattino campaign. As stated, these are bonafide lies, false allegations of criminal behavior and were witnessed here only after publication. What was the response when a public retraction and apology was made to the head Cave-dweller? Nancy Pincus responded, in writing, "Go to hell." Who's responsible for the months and months of this behavior simultaneous to Ravi Bhalla's mayoral campaign last summer? It's not in any shape or form ethical. It's below the NHSA sewer system. The same pattern has been exhibited over months since Ravi Bhalla declared his campaign for mayor last summer. This unethical behavior and worse attacking people is way beyond the pale. If you think it's a problem, maybe start listening to people who will talk to you questioning your bad behavior. If you think it's more than a little problematic, apologize and stop doing it. Ravi Bhalla will get by. Fact is, this woeful Hoboken411 behavior has gone on for months; so don't cry because you've left an unethical laundry list of ugliness in your stinking wake and are again called to account. Have a nice day Sybil and same to your little merry band with the Shadow and Ravibot cave-dwellers.